From the one screenshot we see, we can tell that snoozing will support several options: later today, tomorrow, this weekend, next week, someday, along with options to pick a specific date & time, or a place. That should be handy if you want to snooze your booking email until you get to the hotel for example. And smart groupings seem to be similar to Inbox, in putting together related emails, such as the ones for trips. 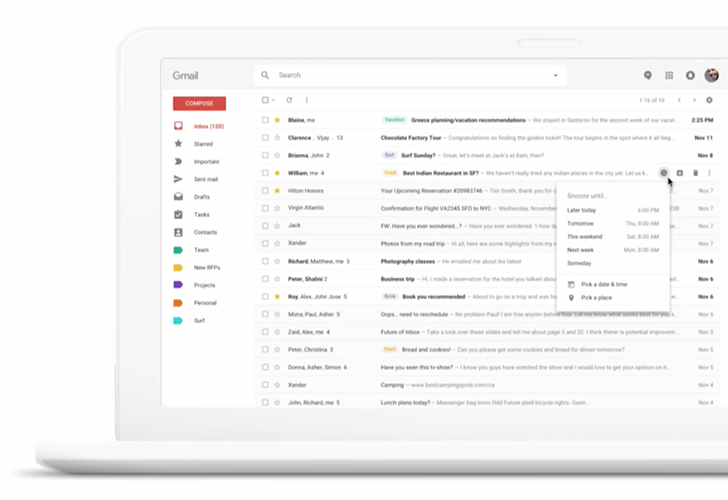 The one other thing you might notice from this screenshot is an entire new look for Gmail on the web. Gone are the big buttons with grey backgrounds and in place we have a cleaner toolbar and bigger colorful icons for the labels in the side bar. If you're interested in hearing everything that was said about these features, I've queued the presentation to the very start of that segment below. 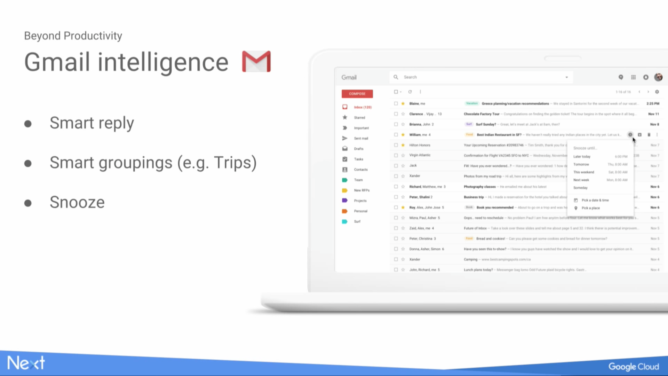 As a staunch Gmail user who just couldn't get along with Inbox (automatic filters are a lifesaver to manage Android Police's crazy inbox), I am quite excited to see snooze and smart groups make it into my favorite email app. These are the two things I always wish Gmail has each time someone mentions Inbox and I'm pumped to see that they won't always be exclusive to the latter.